This muscular, well-built medium-sized dog has strong straight legs and a tail to match. The Kerry Blue Terrier has prominent whiskers, eyebrows and beard. The ears are v-shaped and crease to fall next to the corner of the eye. Intelligent and playful, but requires firm handling. Kerry Blue Terriers originated in Ireland. 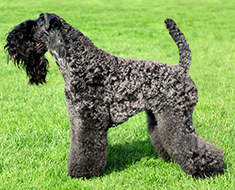 Kerry Blue Terrier males are 18 to 19½ inches (45 to 49 cm) high. Kerry Blue Terrier females are about 17½ inches (44 to 47½ cm) high. Kerry Blue Terriers weigh 33 to 40 pounds (15 to 18 kg). Kerry Blue Terriers come in every shade of blue from silver to steel. Puppies are born blue-black and the coat gradually lightens to silver as the dog reaches maturity. Kerry Blue Terriers shed little to no hair and are odorless even when wet. The Kerry Blue requires trimming roughly five times a year, and weekly brushings. Highly intelligent, determined and playful, Kerry Blue Terriers require firm handling as they may be dog-aggressive. They get along splendidly with people and love to be challenged. Kerry Blue Terriers are prone to PNA, cerebellar abiotrophy. Some minor concerns in Kerry Blue Terriers are cataracts, spiculosis, hair follicle tumors, entropion, KCS, narrow palpebral fissure distichiasisme, CHD and Retinal folds. Kerry Blue Terriers can be expected to live 12 to 15 years. Kerry Blue Terriers do well in an apartment as they are fairly active indoors. Kerry Blue Terriers also enjoy going on long walks at least once a week. Kerry Blue Terriers belong to the Terrier group. Find Kerry Blue Terrier Puppies with our Free Breeder search!